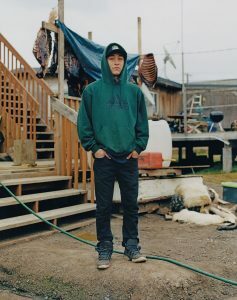 Peter H. Gleick and Laurence Ellis chronicle Alaskans' efforts to fight climate change in Document's Fall/Winter 2018 issue. We live on a water planet, surrounded by a delicate, incredibly thin atmosphere. It should be no surprise that when we look out into space, and when we send our sophisticated satellites and rovers and instruments to peer at other worlds, we’re always looking for water. Without water, life as we know it would be impossible. Cultures around the world have similar sayings and proverbs about the value of freshwater. 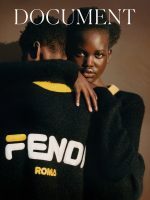 In 1746, Benjamin Franklin wrote, in Poor Richard’s Almanack, “When the well’s dry, we learn the worth of water.” Russians say, “You must drink the water of the river you are traveling on.” An ancient Chinese proverb translates as, “When the river is full, the well is full.” A Kashmiri proverb asserts, “It is easy to throw anything into the river but difficult to take it out again.” Still another saying, “The frog does not drink up the pond in which it lives,” has been attributed to native cultures in the Americas. Three-quarters of the Earth’s surface is ocean. Both the northern and southern poles are massive ice caps. Water surrounds us as vapor in the air and lies under our feet in groundwater. 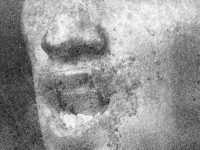 Our own bodies are made up of water—roughly 60 percent by weight. And without the atmosphere above us to filter out dangerous solar radiation and retain heat, the Earth would be a frozen, lifeless ball. Apart from the air we breathe, no other natural resource is as important as water to our health and well- being. Yet humans are facing a very real and very challenging climate and water crisis. 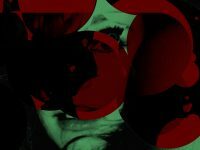 The planet’s burgeoning population, which now exceeds 7.5 billion, is diverting, depleting, and contaminating water and emitting green- house gases in such quantities as to change the very climate on which our lives depend. Most of us today are surrounded by modern technologies unimagined a century ago, and the pace of innovation is accelerating. 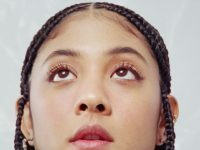 New forms of media connect us in new ways, bringing information to every part of the world and helping us form both virtual and real communities and networks. Yet more than 2 billion people still lack access to safe drinking water, and more than 4 billion lack access to adequate sanitation. Millions of cases of preventable water-related diseases still plague impoverished communities in parts of Africa, Asia, and Latin America. Armed conflicts in which water represents a trigger, a weapon, or a target are on the rise. Water pollution from human and industrial wastes contributes to both ill health and water scarcity. The water available to grow food for our expanding populations is increasingly overdrafted and contaminated. And growing human demands are depriving more and more ecosystems of the water they, too, need in order to thrive. For years, the scientific community has argued that our climate will be changed by the uncontrolled emissions of greenhouse gases, such as carbon dioxide, caused by the burning of fossil fuels and other industrial activities. Those warnings have gone largely unheeded by our politicians. 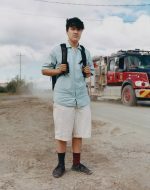 We are now paying the price of that inaction: The planet’s temperature is rising; extreme droughts and floods are expanding; the oceans are warming and becoming more acid, destroying fish populations and coral reefs; and ice in the Arctic, Antarctic, and Greenland is melting at an accelerating rate, leading to sea-level rise and new threats to coastal communities. In order to stave off catastrophic ecological and economic consequences, following decades of inaction, humanity must now act on two fronts: We must rapidly ramp up efforts to slow the rate of climate change by eliminating the combustion of coal, oil, and gas and other actions that emit dangerous warming gases, and we must simultaneously prepare to adapt to the effects of those climate changes we can no longer prevent. 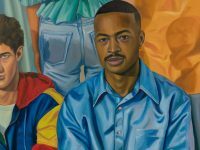 We are all at risk from our own actions and inactions, but the vulnerability of small, local communities, disenfranchised groups, and those living on social and geographic margins deserves special attention and protection. 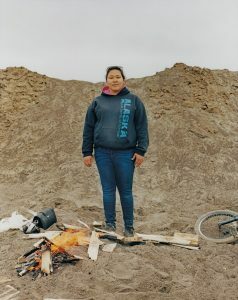 The haunting photographs that Laurence Ellis made for this portfolio highlight some of these remote communities in Alaska, which are contending with shoreline erosion, melting glaciers, and thawing permafrost. Ellis focuses in particular on the lives and challenges of younger people, who will be on the front lines of the most severe consequences of climate change and water scarcity. Left: Young man in parking lot, Bethel. 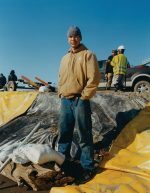 The permafrost under the town of Bethel is deteriorating much more quickly than in most places in Alaska, causing many of the buildings and roads above to warp and collapse. 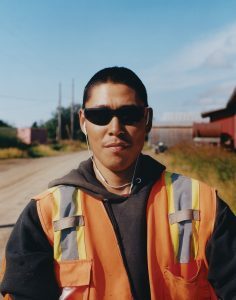 Right: Young man on the side of the road, Bethel. We must act. Sustainability pioneer Donella Meadows once said, “There is too much bad news to justify complacency. 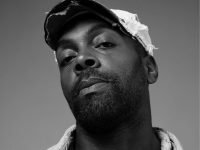 There is too much good news to justify despair.” The good news is that we can move toward a future where every living thing has the water it needs to survive and thrive. We can grow more food with less water using smart irrigation systems. We can wash our clothes and clean our dishes with efficient appliances. We can adapt our diets and consumer choices to reduce our water and carbon footprints. We can move away from reliance on dirty, climate-changing energy sources toward renewable, clean energy. We can take natural resources out of the realm of violence and conflict and move toward peace and cooperation. And we can participate in decisions about what kind of politicians and governments we want by speaking out, voting, and demonstrating. 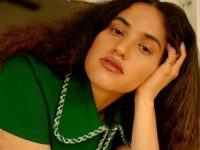 But the transition from our current unsustainable world to a sustainable future will require the participation of all of us, the development of new technologies and ways of thinking, and the overturning of old, outmoded, and dangerous ideas and practices. A sustainable future is possible. Let’s make it a reality. Peter H. Gleick is a climate and water scientist, a MacArthur Fellow, and a perennial optimist. 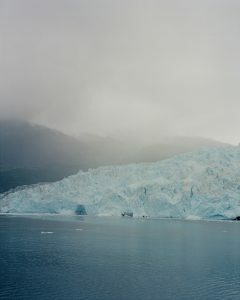 Aialik Glacier, Kenai Fjords National Park. 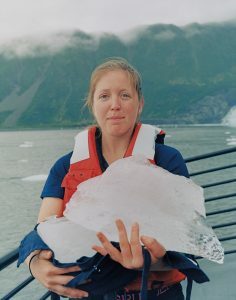 Major Marine Deckhand Natalie Hunter holds a chunk of glacial ice that has calved off of Aialik Glacier. More and more visitors from around the world are coming each summer to visit the disappearing glaciers of coastal Alaska. 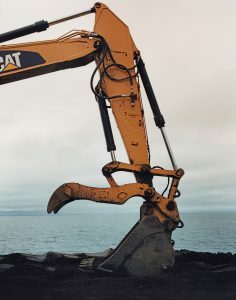 This has been a boon for an economy that has historically depended on resource extraction, even as coastal Alaska is threatened by changes to both its land and seas. Tidewater glaciers along Alaska’s rocky southern coast, like Aialik, pictured, have been retreating dramatically due to a warming climate. Alaska’s melting glaciers contribute significantly to rising sea levels that are beginning to inundate low-lying coastal areas around the world. 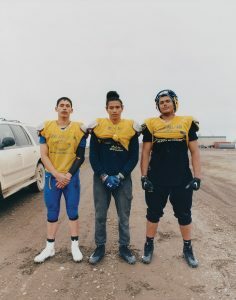 Robert, Osias, and Sebastian, of the Whalers, the Barrow High School football team. 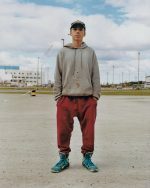 The town of Barrow recently reverted to its original indigenous Iñupiat name of ‘Utqiaġvik’, meaning ‘a place to gather wild roots.’Situated on the Arctic coast, 320 miles above the Arctic Circle, Utqiaġvik is the northern- most town in the US and considered by some experts to be “ground zero” for climate change science. 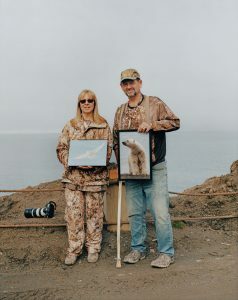 Mike and Cindy have lived in Utqiaġvik for more than 30 years. Behind them is what was once their garden. The rate of shoreline erosion in the Arctic has more than doubled in the last 50 years. Mike and Cindy’s house is now 25 feet from the shore. Seward Boat Harbor, Seward. 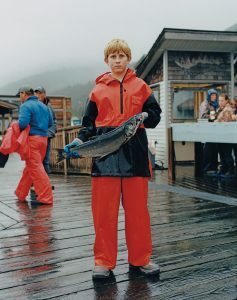 A young man poses with a silver salmon caught during the 63rd Annual Seward Silver Salmon Derby. Many coastal towns have faced fishery closures in recent years, which has led to the declaration of commercial fishery disasters and the cancellation of similar derbies in communities farther south, including Juneau and Wrangell. the impact from the Gulf of Alaska’s frequent and massive winter storms. 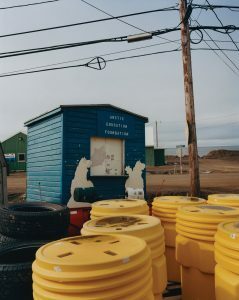 Most buildings in Utqiaġvik are constructed on stilts to avoid thawing the permafrost directly below, which in turn would cause the structures to sink. Many houses in Utqiaġvik are experiencing extreme and visually apparent subsidence due to the thawing beneath them. 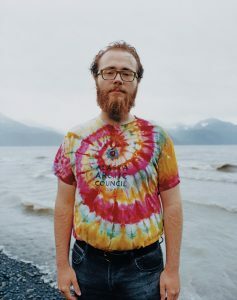 Seeing how the warming and acidifying ocean is affecting the marine ecosystem that his hometown depends on led Griffin Plush, pictured, to join a lawsuit with 15 other young Alaskan climate change activists urging the state of Alaska to address the causes and effects of climate change. the brunt of ever more destructive storms that barrel in from the Arctic Ocean and protects the beaches from further erosion and the town from flooding. 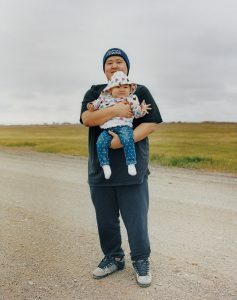 his daughter Brooklyn, photographed on the outer edge of Utqiaġvik. 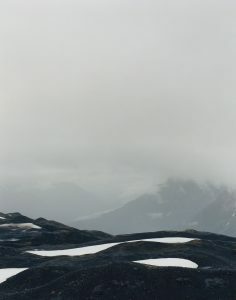 Due to the town’s extreme remoteness, no roads connect it to the rest of Alaska. It is accessible only by plane, except during the short summer months, when it can also be accessed by boat. A teenage couple on the bank of the Kuskokwim River, Bethel. 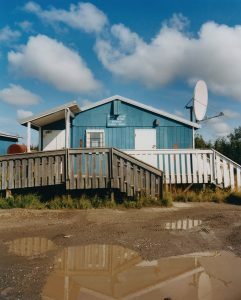 With a population of more than 6,000, Bethel is the largest community on the Kuskokwim River. 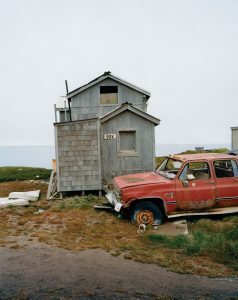 It has been home to the Yup’ik people and their ancestors for thousands of years. 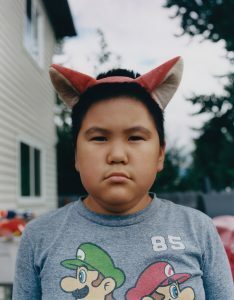 Jedidiah Lance Kaleak, an Alaskan Inuit, photographed in in his backyard, Anchorage. 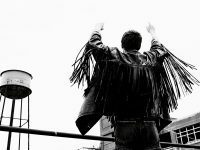 of indigenous culture and the void that is left. 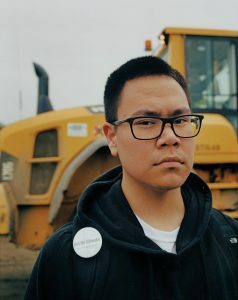 Eben Hopson is a resident of Utqiaġvik and part of the Arctic Youth Ambassador program, based out of the Alaska Geographic Field Institute. Central to the mission of the ambassadors is the promotion of understanding and education around climate-based change in Arctic communities. for food and supply deliveries, was destroyed in May. The village, home to roughly 360 predominantly Yup’ik residents, expects to lose its school and fuel depot by the end of next year. Harding Icefield Trail, Kenai Fjords National Park. 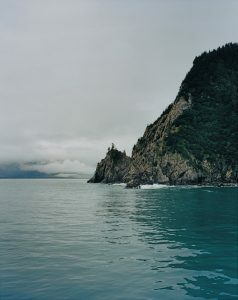 Gillian Braver, Aialik Bay, Kenai Fjords National Park. The US National Park Service is tasked with protecting important and irreplaceable wild places. 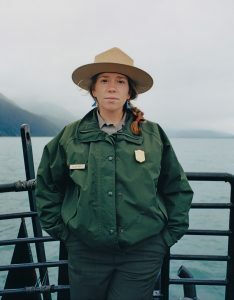 Gillian and her fellow rangers at Kenai Fjords National Park work to protect the park by educating visitors about how climate change affects it. Malia Acovak, Seward. 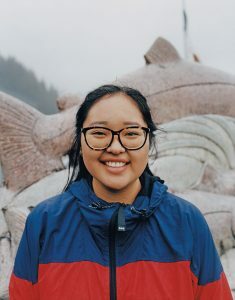 Like many in small coastal Alaskan towns, Malia and her family grew up depending on the ocean. Most summers, she longline fishes Pacific halibut. Three young women outside the Top of the World Hotel, Utqiaġvik. to climatic and associated environmental changes, because they rely on sea ice to hunt bowhead whales. the central Arctic Ocean between 1975 and 2012. 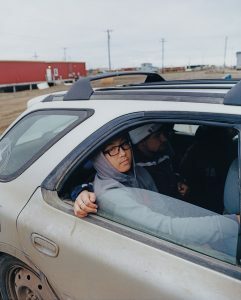 Matthew, Jeffrey, and Louden leave high school wrestling practice, Utqiaġvik. 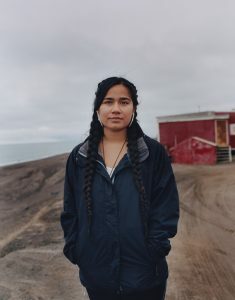 Erica Purruq Khan, Utqiaġvik. Erica is a passionate advocate for Native American cultural preservation. 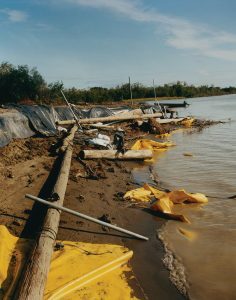 Due to the rapid shoreline destruction, many ancient Native burial grounds and archaeological artifacts are at risk. 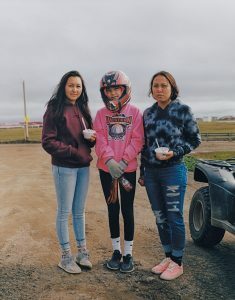 Recently, high school students assisted the Ukpeaġvik Iñupiat Corporation in the exhumation and relocation of 73 ancient burials to a cemetery in Utqiaġvik. 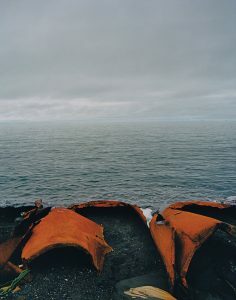 Due to the extreme erosion, the residents of Napakiak decided to relocate as much of their village as possible inland. The entire community, including the man pictured here, has mobilized to do what it can. 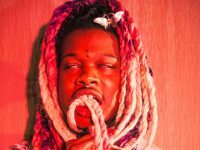 They also appealed to the US Department of Housing and Urban Development (HUD) for assistance. 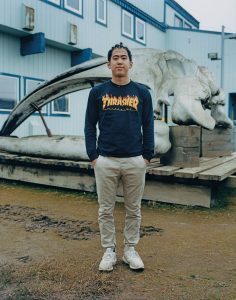 the captain of a whaling crew, which remains at the core of indigenous spiritual and cultural identity within Utqiaġvik. According to the Iñupiat creation story, their land was once a bowhead whale whose death corresponded with human inhabitation of the land. 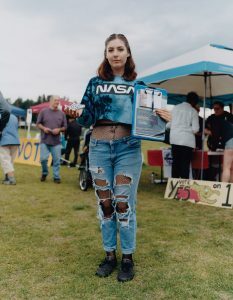 Young woman at Alaska Wild Salmon Day in Anchorage, encouraging Alaskans to vote yes on a bill to protect the salmon habitat from mining and development projects. States in the Pacific Northwest spend billions of dollars each year trying to restore wild salmon runs, which have been decimated in large part by unchecked development. 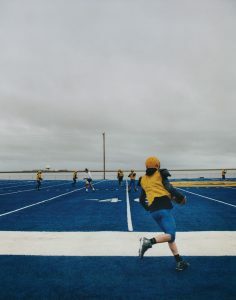 The high school football field in Utqiaġvik, where it is continuously dark for 65 days of the year. The field, which cost nearly $1 million to install due to the school’s remoteness, is now less than 200 feet from the shore.